Ginnikan (Spring 2014, NHK) is a story set during the late 1700s Edo Period. A 10 year old boy named Tsurunosuke was wandering the countryside along with his samurai father, when the father gets killed in an act of revenge. The boy is about to get killed as well but was saved by a merchant, Wasuke (Tsugawa Masahiko) an owner of an agar wholesale business, Ikawaya. Wasuke buys the killer's revenge with one bag of ginnikan (Edo period's silver currency). Wasuke takes the boy with him to become an apprentice in his shop in Tenma, Osaka. The shop's head clerk, Zenjiro (Shiomi Sansei) is very strict with him and critical of the boy's defiant-like, proud Samurai mannerisms. The clerk is also not pleased upon learning that the precious ginnikan was exchanged for this boy. That hard-earned money was supposed to be donated for the rebuilding of Osaka's Tenmangu (shrine), which was destroyed in a fire the previous year. Tsurunosuke, who still clings to his Samurai heritage is unhappy with his situation, especially when he has to take on a new name: "Matsukichi". 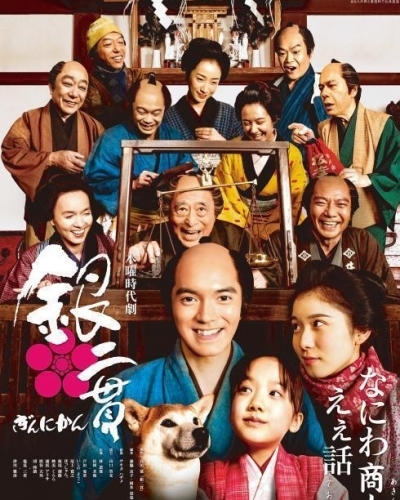 Having no choice but live on, Matsukichi (Hayashi Kento) starts his new life as a humble apprentice, learning the trade, and meeting the townsfolk, including a girl named Maho (Matsuoka Mayu / Ashida Mana). However, the Samurai spirit still lingers inside him, affecting his work and decisions. Will Matsukichi finally be able to relinquish those feelings and open his heart and mind towards the path of a merchant? Final Ep. 9: "The Credibility of Ikawaya"
Having established peace with his father's enemy, Matsukichi has finally let go of the past, and firmly accepts his path as a merchant... Ohiro succumbs to her illness, leaving behind a distraught Maho. Before Ohiro takes her final breath, she tells Maho, "That's enough..." Days after the funeral, everyone is worried about Maho. An exasperated Umekichi and Osaki confront Matsukichi to finally address once and for all his stubborn commitment to stick to his promise not to see Maho... Meanwhile, supplies of agar strips are dwindling. Will Hanbee be able to find good tengusa and deliver new agar in time? Ep. 8 "I have been chasing the past"
Matsukichi had come back to Ikawaya after finally creating a firmer agar, thus fulfilling his promises to Maho and to her father's memory. The new agar had also brought even more profit to Ikawaya, also partly due to Wasuke's crafty business acumen. Now that things seem better, Umekichi finally leaves Ikawaya to take over the Yamshiroya couple's shop, and have a family of his own. Osaki too has finally accepted that Matsukichi is not meant for her and decides to move on... Hanbee who was being threatened by someone from his former employment, had been forced to close his agar production site in his village. Accepting a donation of ginnikan from Ikawaya, he had set off to find good quality seaweed, and a place to build a new agar factory... Meanwhile, as promised, Maho and Matsukichi continue to not see each other. Moreover, Ohiro's sickness has been getting worse... Then one day, a man came to Ikawaya. He asks to see "Tsurunosuke", and introduces himself as Tatebe Genbu, the samurai who killed Matsukichi's father many years ago. Wasuke reminds Genbu that he had already sold off his revenge for the amount of gin 2 kan, and had promised to not come near Matsukichi again. However... "The revenge..." Genbu says, "is not worth as much..."
Ep. 7: "The Taste of Itokanten (Agar Strips)"
Ep. 6: "Both Our Dream"